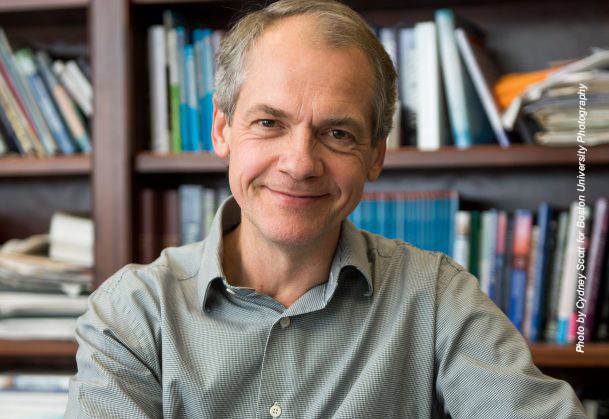 APS Fellow Stefan G. Hofmann, a professor of psychology at Boston University (BU), has received the Alexander Von Humboldt Foundation Award for his study of cognitive behavior therapy (CBT), anxiety disorders, and depression. The award, established by the German government to foster international cooperation in academia, recognizes scientists whose cutting-edge discoveries are expected to lead to even greater insights in the future. Hofmann, associate editor of Clinical Psychological Science, is currently investigating how interventions ranging from antibiotics to yoga can be used to treat social and generalized anxiety disorders with support from a pair of grants from the National Institute of Mental Health. As director of the BU’s Psychotherapy and Emotion Research Laboratory, his research has also focused on the psychopathology and neuroscience of anxiety disorders, how culture influences the expression of mental disorders, and how clinical scientists can adapt psychological treatments to be more culturally sensitive and effective. The $77,000 award will fund a 12-month stay in Germany in which Hofmann, former president of the Association for Behavior and Cognitive Therapies, and Paul Pauli, a professor of psychology at the University of Würzburg, will collaborate to further research investigating the psychological mechanisms underlying CBT. The Humboldt Foundation, named for celebrated naturalist Alexander von Humboldt, grants up to 100 research awards annually to academics abroad based on the nominations of their German colleagues. Thank you for your work, Dr. Hofmann…especially your recent collaboration with Dr. Hayes on the new Process Based CBT book. As a psychologist working on the ‘front lines’ in a government healthcare operation, it is very heartening to see prominent researchers/clinicians in the area of cognitive-behavioral therapy express an appreciation for the philosophy of science proper as a core competency. When I was earning my doctorate at the University of Louisville, one of the courses I took outside the department was a course in the philosophy department on the philosophy of science. I found the course invaluable and came to believe that it should be a required course taken early in a clinical psychology doctoral program. Through your work, you’ve made that more likely and probably laid the groundwork for many ‘course corrections’ that our field will have to engage in to avoid accumulations of error over time. Thank you!